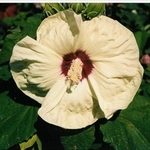 Hardy hibiscus moscheutos 'New Old Yella' PPAF. This is a new spin on an old favorite. Similar to its parent 'Old Yella', but much shorter in size. There is also an improvement in the color with the petals maintaining that creamy yellow color even after the buds have opened. Small green maple-shaped leaves. Blooms early on and keeps blooming to fall. 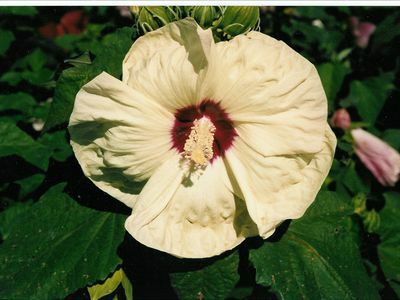 Tolerant of dryer conditions than most perennial hibiscus. An introduction from the folks at Flemming's Flower Fields.